It is known that the name "Bollywood" emerged from mixing words Bombay (now called Mumbai) and Hollywood, because Bollywood is the Indian equivalent of Hollywood. It also, as Hollywood, has its stars and idols. Bollywood movies usually last more than three hours. They are made so fast that sometimes scenes are shot for different films but have the same actors and actresses and background. In comparison with Hollywood, Bollywood produces a significantly greater number of Indian films. More than 14 million Indian people visit cinema every day. Indian film industry is full of star life, rumors and events and here is the top 5 overview of events that are going to happen this spring. The Indian first fit cinema festival is organizing by Ritebite Max Protein. Such kind sport and cultural event will happen on 12th of March, 2017. It will take place in Mumbai. All participants will cycle to cinemas and gather at the point place at 7:00 am. 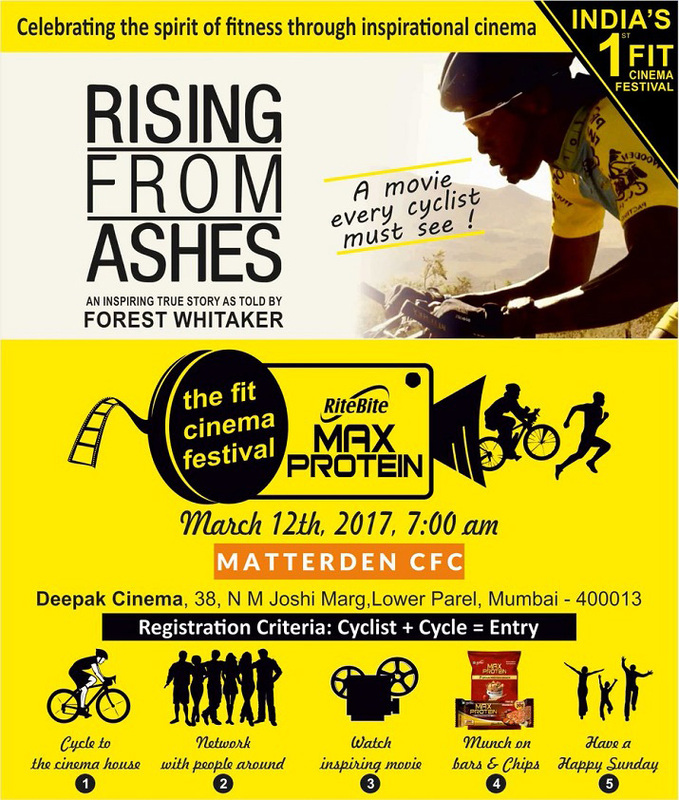 Inspirational cycling movie "Rising from Ashes", which was released in 2012 will be showing at the screen to make the participants enjoy the atmosphere, created by organizers. It is an uplifting documentary film about the formation of cyclist's team, which tells about tremendous spirit of athletes as they fight to overcome the terrible genocide, and strong redemption of the famous American cyclist who led them. Healthy sweet bars and chips will be received by all participants. This event is held to promote sport and a healthy lifestyle, as well as the culture of the nation. The super musical event is dedicated to 75th birthday of the legendary movie star Jeetendra. His living experience can inspire many of us, as he could reach the stardom, coming from a lower middle class. The Living Legend, himself, will be presenting on the occasion to bless the event and bring grace to viewers. It is the first cultural event, which is aimed to celebrate recognition from people, who love him as a hero, then huge contribution of the star to film industry in India and his inspiring nature. It will take place in Mumbai on April 16, 2017. The real name of Jeetendra is Ravi Capoor. He is considered to be a miracle of Indian film. As an actor, he has been shooting in more than three hundreds films during thirty five years. Despite of critics comments, he receives fame and love from his fans, which helps him to live further. Now, he is known for his charity activity. He takes part in the reality show "Surveer", where he supports singing talents from low economically families. This spring, Bollywood stars are going on a big tour around the different countries of the world with a concert that promises to be a real spectacle. The concert will feature the participation of such super star like Salman Khan. He is not only an actor but also a producer, and television personality. He is known for his unique dance style which is widely imitated by many people. Da-bang the tour also involves such Indian celebrities like Sonakshi Sinha, Prabhu Deva, Badshah and many others. Many of them are popular Indian choreographers and actors. The host of the concert will be Manish Paul, who will be responsible for keeping the audience entertained and captivated. It is impossible to imagine Bollywood without such events as the release of the new acclaimed film. This year Bollywood is going to thrill with upcoming blockbuster, which ensures film fans that they will appreciate the real good film. This is the Baahubali: The Conclusion. It is an epic fiction story, which is directed by S.S Rajamouli. The film is a sequel continuation of the first part Baahubali: The Beginning. It is the famous history, which tells about brave warrior. Many years ago the protagonist of the film saved the king himself. He gave the guy the name of Shivudu. The Royal family of the boy was brought up as a true heir to the throne. Shivudu was perfectly trained and gained fighting skill. Reaching adulthood, the young man was already known as a fearless warrior, ready to do anything for victory in battle. Shivudu never dreamed of becoming the head of the country, however, realizing that his brother will lead the state to collapse, he changed his mind. Tough confrontation between the brothers is likely to bring the tragic end for one of them. The budget of the Baahubali is in top of the most expensive films in Bollywood. It will be shown in the cinemas on 28 April, 2017. Recently the trailer of upcoming film "Phillauri" with participation of Indian actress Anushka Sharma was known to public. Cinema critics after watching the trailer, found it similar to the animated cartoon of the famous director Tim Burton "Corpse Bride" which was released in 2005. Special similarity is found in the idea of the film. Phillauri is a man, who is "manglik" and to solve this problem he was asked to marry a tree. The tree is the residence of Shashi, a kindly ghost. She insists on Phillauri regard her as his bride. What concerns the cartoon of Corpse Bride, who is Victor and voiced by famous Hollywood star Johny Depp, he doesn't want to marry and runs away from the wedding ceremony, which is nearby jungles. Approaching the tree he slips unexpectedly and by chance puts the ring to a tree, which is also the home of a ghost Emily, voiced by Helena Bohnem Carter. The film will be released on March 24, 2017. Well, whether "Phillauri" has similarities or not, it will be known after watching the full version, but nevertheless the trailer asks to prove or deny the opinion of the critics. This is the review of approaching spring events which proves that Bollywood has its own rich life, full of news, gossip, parties, shows, concerts and of course forthcoming blockbusters that may soon be able to compete with Hollywood in reaching the worldwide fame. Brothers Steeds started working as movers in 1997, while studying at high-school. Because of their busy schedule, both came across with difficulties finding part – time job. Once they helped their friend's parents to move. And since the idea of making such labor service came to their minds. The customer should pay $20 and provide with pizza for done work. The Steeds liked such work-out business not only because of salary, but gratitude they received from clients. If you are looking for modular homes then click here .